May 14-16 delivered three beautiful days for the Watts N Water 1999 race in Randolph, New Jersey. 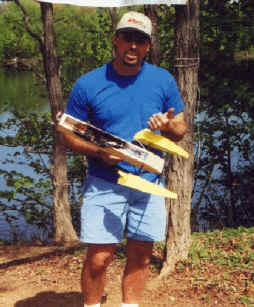 Boaters from Michigan, Pennsylvania, New York, and New Jersey areas all enjoyed a spring weekend of model boat racing. The good weather brought great racing conditions and record breaking moments in the 1/16 sport scale. 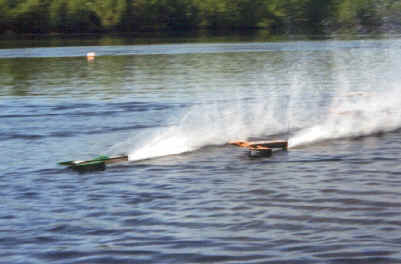 This NAMBA sanctioned race was hosted by the Morris County Electric Boat Club. Not only was the competition hot, so were the boats. Two boats caught fire over the three day weekend, taking them out of competition. This helped create the overtone for a weekend of smoke on water! This Watts N Water race ran a few of the larger cell classes as they became more popular. One example was the 18 cell mono classes me this challenge on Friday. In today's racing world, a racer would own one hull for many classes. By increasing cells, he becomes eligible for a new class. 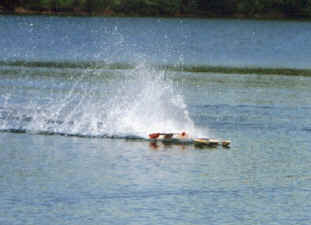 The previous record for 1/16 sport scale was destroyed by 3 seconds. 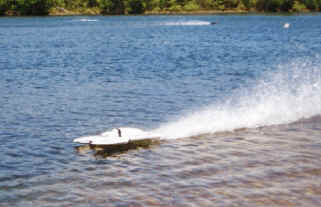 Driver was Doug Twaits, Jr. using an Electric Thunder hull. To highlight the most exciting heat of the weekend, we must go to the 3rd round of P Hydro! Drivers of this heat were Russ Kremens, Chris Fine, Doug Twaits, Jr. and Norman Barksdale. During lap 3, Russ Kremens challenged the leader in the last turn. Doug Twaits, Jr did all he could to hold off Russ's advance to the finish line. Another exciting heat of the weekend was N2 Hydro starring Dennis Whitt from Michigan, co-starting Russ Kremens, Jr racer Steve Matus, and Chris Costanza. When the smoke cleared, Dennis Whitt won the heat, the class, and the fast time award. 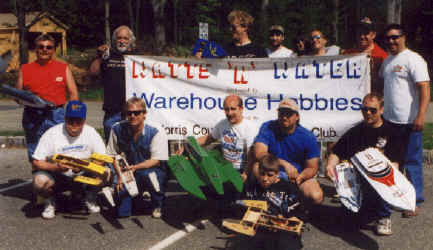 The Morris County Electric Boat Club thanks all sponsors of this even, in particular Wharehouse Hobbies for sponsoring all class trophies and for donating several complete boat kits with hardware. Other sponsors include Jackson Hobbies who donated the Fast Time trophies, Chris Fine of Fine Design, Traxxas and numerous other companies that donated prizes for a very successful event. We also want to thank all the racers who participated in helping make this rave a success. An added thank you to Gerry Yarrish for taking the time to help promote this event. 1. Doug Twaits Jr 1. Doug Twaits Jr.
Special thanks to Doug Twaits Sr. for submitting this article to Rum Runner!